NACK held its Indian Island Paddle and Barbecue this past Saturday and the conditions were perfect. The morining began with heavily overcast skies but this time the weather predictions were right and bright sun prevailed. Indian Island is a Suffolk County Park nestled between the twin forks of Long Island where the Peconic River empties into Peconic Bay. 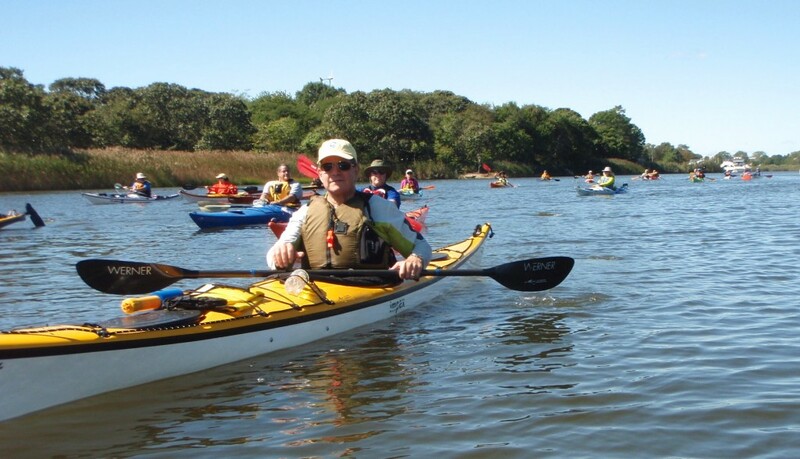 Twenty two paddlers traveled from the beach at Indian Island Park into Peconic Bay and into the Peconic River as far as the spillway in the village of Riverhead. This paddle also marked the maiden voyage of Ann’s Toibote, a skin-on-frame kayak based on the North Alaska Recovery Kayak with a finish reminiscent of the Disney clown fish character from Saving Nemo. Meanwhile, in the shade of towering pines, another group remained behind to put together a fabulous feast to greet the paddlers upon their return. After getting back to the beach members were treated some really great food.. Besides the standard burgers and hot dogs folks brought along some terrific homemade dishes like barbecued chicken, pork skewers, sausage, delicious salads, and some great grilled veggies. (Brussels Sprouts never tasted so good! ) Then top it all off with cherry pie, brownies and homemade cookies. Many thanks to Colin, Dara and Renee for putting the event together, and the rest of the members who provided us with a wonderful array of delicious food.